The world of the meeting professional moves at a fast pace. To be successful, planners need to stay on top of an array of constantly shifting issues that can make or break any event or strategy. Northstar Meetings Group has produced 2017 Global Meeting Activity: What You Need to Know, providing critical insights from the 2017 Global Meetings and Events Forecast by American Express Meetings & Events, along with vital takeaways from top meeting planners that zero in on best practices and tricks of the trade. Where is Group Demand The Strongest? How Do Group Air Trends Affect In-Demand Destinations? 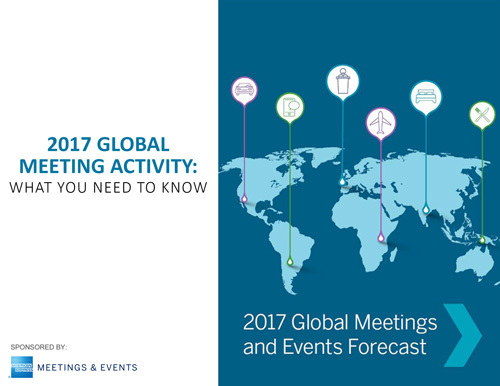 2017 Global Meeting Activity is sponsored by American Express Meetings & Events. Northstar Meetings Group's influential brands—Meetings & Conventions, Successful Meetings, Meeting News, Incentive, SportsTravel, and TEAMS—currently serve over 350,000 active meetings and events planners, and incentive professionals, across an integrated suite of data, digital, events, and print products.